Not surprisingly, many herbs fall into the category of vegetation with aromatic leaves. And the present list is dominated by herbs, including thyme (Thymus). Although creeping thyme is most popular in landscaping because it can be used as a ground cover, there are also thyme plants with upright forms. Not all types of thyme are created equal when it comes to smell, so take a sniff at the garden center before buying. Like other members of the mint family, catnip (Nepeta cataria) is an aromatic herb. Catnip is famed for the effect that it produces on some of our feline friends. Its fragrance drives them wild, affording their human companions good cheap entertainment. Catnip is but one of the catmint plants, all of which have fragrant leaves. While catnip attracts cats, bee balm (Monarda didyma) attracts hummingbirds. It's another member of the mint family. Along with yarrow, it has one of the showier flowers of the plants in the herb category. Like creeping thyme, sweet woodruff (Gallium odoratum) functions as a ground cover in landscape design. Its whorled leaves and star-shaped flowers bring cheer to shady areas of the yard. The aromatic foliage intensifies in fragrance when dried, making sweet woodruff herbs a natural for potpourris. The aromatic herb, sage has many uses, one being culinary. For example, sage is commonly used to flavor stuffing. Sage is an "acquired aroma," but, if you enjoy cooking, you may well enjoy the smell of sage, by association (with good food). The sage referred to here, Tricolor sage (Salvia officinalis Tricolor), has the advantage of being highly ornamental, to boot, as its leaves boast three colors. You may know the term "sagebrush" from the old Westerns. But that shrub is more closely related to wormwood (Artemisia) than to the "sage" referred to here. There are also ornamental wormwoods grown in landscaping for, among other things, their fragrant leaves. For example, A. schmidtiana Silver Mound is short, tidy, and compact, making it useful as an edging plant. By contrast, A. ludoviciana Silver King is a taller, wispier plant; its branches are harvested and dried in fall for use in wreaths. Yet another scented plant with "sage" in its common name is Russian sage (Perovskia atriplicifolia), a subshrub similar to (but taller than) lavender. Yarrow's aromatic foliage bears a fern-like appearance. The texture of the leaves is fine, making yarrow a good plant to group with coarser-leafed plants to create contrast. Like the other plants just listed, yarrow, although often thought of as just another perennial flower, is considered an herb. In fact, its medicinal qualities are the source of its botanical name, Achillea. It's not coincidental that the name sounds like Achilles, the hero in Greek mythology. 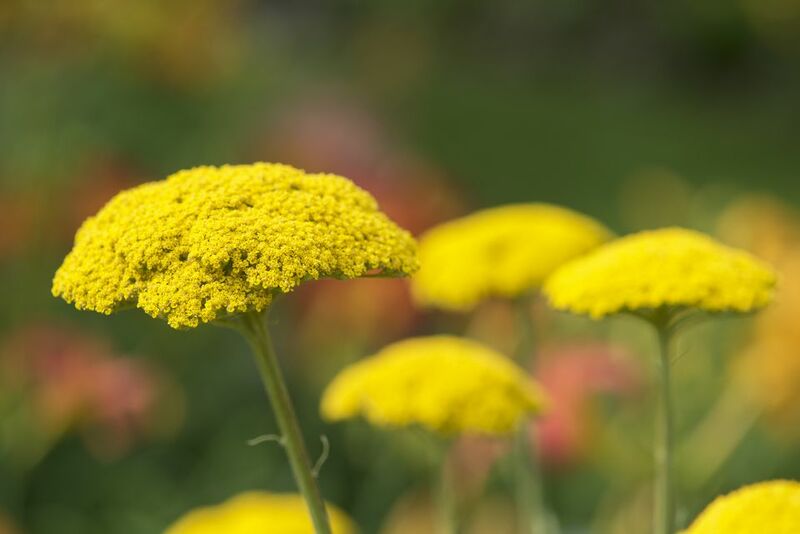 Achilles is thought to have used yarrow as an herb to staunch wounds, and botanists gave his name to the plant when it was time to assign it a scientific name. So far, all of the examples of plants with aromatic leaves have been herbs and have been of a similar height. Now let's shake things up a bit, using non-herb examples ranging from giants to ground-huggers. Not everyone would include lantana (Lantana camara) on this list of plants with aromatic leaves. Its foliage gives off a citrusy fragrance when crushed that some find intoxicating. But others find it too pungent. At the very least, you'll have to admit that lantana's foliage gives off one of the stronger, cleaner plant scents you'll ever smell. Lantana grows as a shrub in hot climates, but Northerners are more familiar with its use in hanging pots. The hemlock on the list is not poison hemlock (as in the hemlock that killed Socrates), but rather the evergreen native to North America (Tsuga canadensis). Many of the needled evergreens sport aromatic leaves, but what makes hemlock worth mentioning is that it's very popular as a hedge plant. So if you'd like a hedge that not only serves as a privacy screen but also smells great, consider growing hemlock. Somewhere in between lantana and hemlock, in terms of height, is bayberry shrub (Myrica pensylvanica). Don't confuse it with bay laurel, which also has fragrant leaves. As you would expect with a shrub bearing that kind of name, it's the berries of bayberry that usually come to mind when people think of this plant. But it's included here because its leaves give off a pleasant aroma when rubbed. Another shrub with nice-smelling foliage is bluebeard (Caryopteris × clandonensis Longwood Blue). Even weeds and weedy perennials can smell good. They're worth knowing about, even though you wouldn't want to plant them. Tansy (Tanacetum vulgare) isn't a desirable plant to grow in the landscape, especially in North America, where it's an invasive weed. Tansy is also a poisonous plant, both to people and to livestock. This weed does, however, enjoy a rich history of medicinal and culinary usage. Like yarrow, tansy has feathery, aromatic leaves. If you happen to see some tansy growing along the roadside, admire its pretty clusters of button-shaped, golden-yellow flowers. Ground ivy (Glechoma hederacea) goes by a number of other names, too, including "creeping Charlie" and "gill-over-the-ground." Another member of that great-smelling mint family, ground ivy used to be an herb held in high regard. But now it's considered an invasive lawn weed in North America. One thing you can say for ground ivy, though, is that mowing a lawn "invaded" by this weed will be a pleasure for your nose. As your mower blade slices into the ground ivy, its aromatic leaves will release a pleasing fragrance into the air, blending with that more familiar freshly-mown-lawn smell. So while you may be trying to remove ground ivy from your lawn as part of your weed-control efforts, remember to enjoy its aromatic leaves while it's still around. How to Grow Catnip: It Might Not Make Your Cat Tipsy!